I finished up another pretty big piece of the game, the way players choose which dungeon to play through. Now the global variables that control that stuff are accessible in game. I added the ability to quit and be taken back to home from the pause menu or death menu. 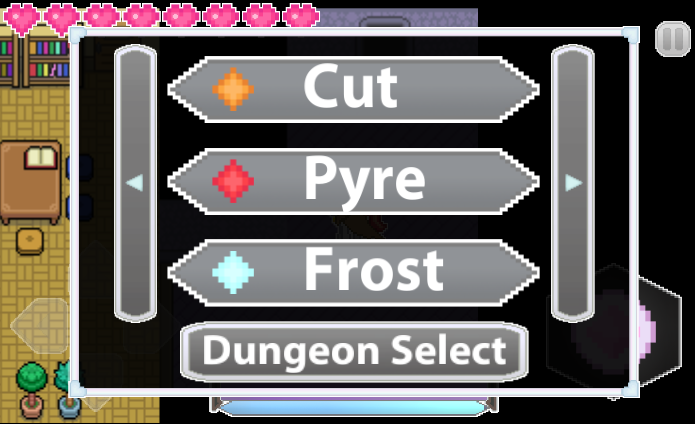 When players approach the crystal ball the action icon changes and pressing it brings up the choices of Dungeons, Bosses, and Random. Dungeons brings up all the dungeons you can play in any order, bosses brings up the boss fights you can do again, and Random makes it so that each dungeon room you enter is randomized based on ones you've beaten before. The diamonds are colored in for the dungeons you already beat while the others are grey. Pushing the page buttons shifts between the 9 dungeons so players can choose to play any level they want from the start.